Did you take part in Daylight Hour 2017? This year, Great Forest joined clients and more than 820 offices around the world, turning off the lights in about 100 million square feet of office space, saving enough energy to power 9,400 homes for a day! And we were rewarded for it too! Not just for our energy savings. 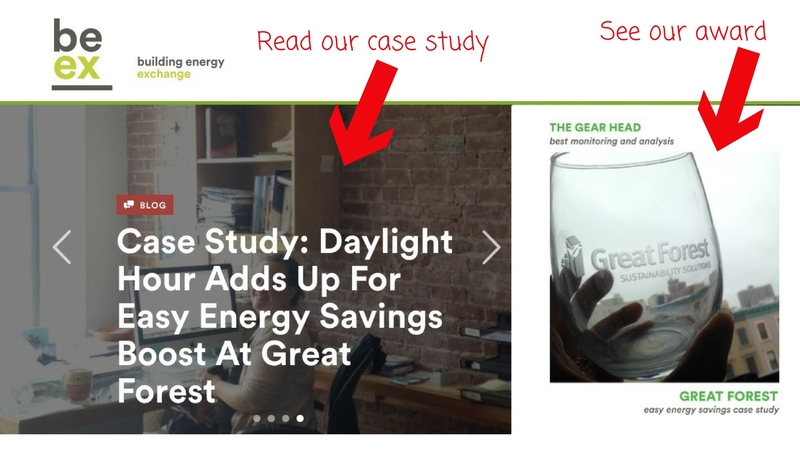 The creative folks behind Daylight Hour recognized us with the honorable “The Gear Head” award for Best Monitoring and Analysis, and featured our case study on the front page of Building Energy Exchange. This follows our win last year of the Hype Master award for our Daylight Hour social media efforts. We couldn’t ask for more, but we are going to. We are going to ask every person reading this to switch to daylight whenever they can. You don’t need to wait for next year to participate. You can institute Daylight Hour every day, or start Daylight Fridays, which we have observed officially in the Great Forest office for the past year. The payoff is worth it. As we noted in our case study — it is a quick and easy energy savings boost. We hear the movement is growing. New York and San Francisco are among 12 cities that have signed up as Daylight Hour city partners, spearheading the campaign in city facilities and private sector businesses. Way to go. Congratulations to all winners. This entry was posted in All, Awards and tagged Daylight hour, Energy. Bookmark the permalink.